British-israel.us -- Do the Wicked Suffer Forever in HELL? Do the Wicked Suffer Forever in HELL? Does God roast the wicked in HELL for all eternity? Will wicked men burn in "everlasting fire"? Will the Devil be "tormented forever"? What is HELL? Where is it? Who will be thrown into hell? What did Jesus mean by "their worm dieth not"? Why did the rich man ask for only a drop of water? “Tartarus” is used once, in 2 Peter 2:4, and means “a place of darkness or restraint.” “Tartarus” is where Satan and his demons reside now. It isn’t a place of punishment or flames. “Gehenna” means a place of fire, brimstone, and punishment (see Matthew 5:29-30, described in Matthew 13:40-42 and 2 Peter 3:7.) Note these flames are still in the future at the end of the world. “Hades” means “the grave” (Acts 2:31; 1 Corinthians 15:55; Revelation 20:14). The body of Jesus rested there and His saints are resting there now awaiting the resurrection. The Greek word gehenna denotes a place of punishment or burning. 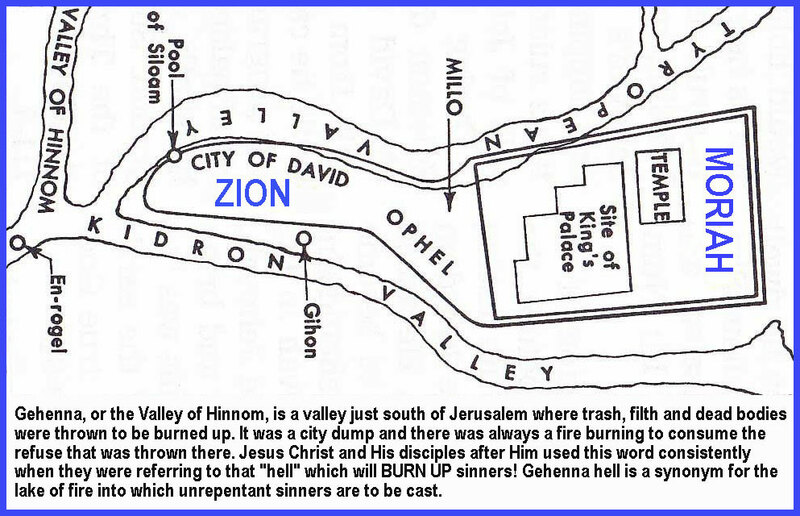 Gehenna, or the Valley of Hinnom, is a valley just outside Jerusalem where trash, filth and dead bodies were thrown to be burned up. It was a city dump and there was always a fire burning to consume the refuse that was thrown there. Jesus Christ and His disciples after Him used this word consistently when they were referring to that "hell" which will BURN UP sinners! Gehenna hell is a synonym for the lake of fire into which unrepentant sinners are to be cast. This is the only hell in the Bible which is associated with flames or fire. To explain the usage of the two basic words used in the Greek language and translated "hell" in the English language in the King James Version: "And death and hell (hades -- the grave) were cast into the lake of fire. This is the second DEATH. And whosoever was not found written in the book of life was cast into the lake of fire" (Rev. 20:14-15). The grave itself and those who are not found written in the book of life are going to be cast into the lake of fire -- gehenna hell. This will empty the graves --	hades hell. They will all be burned up -- to ashes (Mal. 4:1; Rev. 20:14; Matt. 3:10-12). “The smoke of their torment ascendeth up for ever and ever” (Rev. 14:11)? Jude 7 says, "Even as Sodom and Gomorrha, and the cities about them in like manner, giving themselves over to fornication, and going after strange flesh, are set forth for AN EXAMPLE, suffering the vengeance of ETERNAL FIRE"! Are these cities still burning and yet not being consumed? Of course not! Therefore the “eternal fire” has gone out. The phrase, “eternal fire” means a fire whose results are permanent or everlasting. Sodom and Gomorrah have never been rebuilt. It was “unquenchable” by man (see Matthew 3:12; Jeremiah 17:27; Isaiah 66:24). The destruction of Sodom was also an “example” of what will happen to the wicked at the end. According to the Bible, God’s eternal fire turned Sodom into “ashes” (2 Peter 2:6) “in a moment.” Lamentations 4:6. This is similar to what will happen to all the lost at the end of the 1000 years when they are cast into the lake of fire, “which is the second death.” (Revelation 20:14). "And if thy hand offend thee, cut it off: it is better for thee to enter into life maimed, than having two hands to go into hell, into the fire that never shall be QUENCHED"! (Mark 9:43 --	see also Matt. 18:8-9) Does that mean burning forever, and never burning up? In Jeremiah 17:27, God warned the Jews that Jerusalem would be burned, and the fire would not be QUENCHED -	unless they repented. In Jeremiah 52:13, you read the account of the burning of Jerusalem. That fire was not quenched! It burned itself out. It is not still burning. In Mark 9:48, Christ spoke of "their worm" that "dieth not." Was Christ talking about the immortality of worms? What did Christ mean? The lexicons define the Hebrew (Isa. 66:24) and Greek (Mark 9:48) words translated "worm" as a grub or maggot. Actually, Jesus was here warning his listeners that those who would "offend" -- who would live a life of rebellion against God -- would be cast into "hell fire" (9:47). Jesus was referring to the Gehenna Valley as a type of the second death in the "lake of fire" which will befall the ungodly. The Valley of Hinnom was located outside of Jerusalem and was a place where trash, filth, and the dead bodies of animals and despised criminals were thrown. If anything, especially a dead body, landed on a ledge above the fires, it would be devoured by many worms or maggots which were kept alive by the animal and vegetable substances thrown there. Christ was referring to these worms when He said "their worm dieth not." But Christ didn't mean that each individual worm continued to live forever! Actually, these worms, or maggots are the larvae which develop from eggs deposited by flies. They continue for only a few days in this larval stage, then they pupate and finally emerge as flies, later dying. The Holy Spirit is the spirit of a sound mind (II Tim. 1:7). This same reference to worms is found in Isaiah 66:24. Here we again find that the Hebrew word simply means a common grub or a maggot. These worms or larvae also feed on the dead bodies for a few days, and then emerge as flies. Thus, these worms "die not" but continue to develop into flies just as any normal, healthy worm! The flies continue to deposit their eggs only as long as there are dead bodies or other matter for the larvae to feed on. The verse is not talking about LIVE people, but the "CARCASES of the men that have transgressed against me" (Isa. 66:24). They are not alive and consciously suffering in any case! Will the Devil Be Tormented Forever in an Everburning Hell? In Matthew 25:41, Jesus Christ warned that unsaved sinners will enter “the everlasting fire prepared for the devil and his angels.” Many read this and say, “The lost will sizzle forever.” But in John 3:16 Jesus also declared, “For God so loved the world, that He gave His only begotten Son, that whosoever believes in Him should not PERISH, but have eternal life.” So which is it? Will the damned roast eternally in “everlasting fire” or finally “PERISH,” and thus cease to exist? This verse is mistranslated. The word "are" is in italics. This means that it was supplied by the translators and is not in the original Greek. It should be "were cast." (cp. Ps. 37:20). The beast and false prophet were cast in at the beginning of the Millenium (Rev. 19:20). Further, the word “forever” in this verse does not necessarily have to translate forever. The Greek word used for “forever” in this verse is aion - and means an indefinite time period. Jonah was in the fish “forever” before he came out (see Jonah 2:6). Samuel’s mother wanted him to serve God in the temple “forever” which really meant “as long as he lives.” (1 Samuel 1:22, 28). But Ezekiel chapter 28 reveals the full truth. While initially discussing the ancient “king of Tyre” (Ezekiel 28:12), God’s prophet then looks behind the scenes and identifies Lucifer himself, “the anointed cherub” (verse 14), who inhabited “Eden the garden of God” (verse 13), and who was originally “perfect in [his] ways from the day [he] was created,” until “iniquity was found in [him]” (verse 15). Moving on to Satan’s final fate, God declares, “I bring forth a fire from the midst of you, it shall DEVOUR you, and I will bring you to ASHES upon the earth in the sight of all them that behold you… You have become a horror, and shall be NO MORE forever” (verses 18 and 19). Satan will become "ASHES" and “be NO MORE forever”. God is NOT an unmerciful tyrant that tortures the lost forever. "Scripture cannot be broken!" (John 10:35.) "No prophecy of the scripture is of any private interpretation" (2 Peter 1:20) --	but each passage is interpreted by other texts! Psalms 37:20 says, “The wicked shall PERISH ... they shall CONSUME; into smoke shall they CONSUME away.” Psalms 37:38 says, “Transgressors will be DESTROYED together.” Ezekiel 28:15, 18-19 says, Even Satan will become “ASHES” on the “earth” as a result of the fire. Malachi 4:1, 3 says the “day cometh” when the lost “BURN UP ” and become “ASHES.” John 3:16 says those who are lost will “PERISH.” Romans 6:23 says the wages of sin is “DEATH,” not eternal life burning in hell. Matthew 10:28 says “Fear Him who is able to DESTROY both soul and body in hell.” Revelation 21:8; 20:14 says “The lake of fire ... is the second DEATH." Matthew 13:42 says the lost will finally be cast “into a furnace of fire.” Matthew 3:12 says the lost will "BURN UP" in “unquenchable fire.” 2 Peter 3:7 says “The heavens and the earth which are now ... are reserved unto fire.” 2 Peter 3:10 says “The earth and the works that are in it will be BURNED UP.” The wicked will not suffer in fiery flames throughout eternity. “As the weeds are gathered and burned in the fire, so will it be at the end of this world" (Matt. 13:40). Both the day of judgmnt and the "lake of fire" occur at the end of the 1000 years (Rev. 20:11-15). The earth becomes one big “lake of fire” as God purifies it from sin. The lost suffer the “second death” in that lake. Then there is a new heaven and a new earth, for the first heaven and first earth (where the lake of fire was) has passed away. In the New Earth, there will be no more pain, suffering, sorrow, or death. If the lake of fire burned forever, there would always be pain and sorrow somewhere in the universe and Revelation 21:1-4 could never come true. A careful analysis of the Luke 16:19-31 reveals Jesus Christ was talking to the Pharisees who were “lovers of money” (rich men) and who “derided him” with their tongues (verse 14). The reason why Jesus spoke of the rich man asking for water on his tongue was to teach the Pharisees that their “tongues” were going to lead them into hell-fire. These Pharisees also believed riches were a sign of God’s favour while poverty represented His curse. Jesus exposed this false theory. At death there is “a great gulf fixed” (verse 26) which cannot be bridged. Our destiny will be decided by our decisions in this life. Many want to see a miracle before they will believe. Jesus said, “If they do not hear Moses and the prophets, neither will they be persuaded though one rise from the dead.” (verse 31). Why did Jesus use the name Lazarus? This story was a prophecy. Jesus did raise a real man named Lazarus (John 11), yet the Pharisees were not convinced and chose to put Jesus “to death.” (John 11:53). The time when the angels carry Lazarus and the saints into sharing the inheritance with Abraham --	into Abraham's bosom --	is the time of the resurrection. Christ shall "send his angels with a great sound of a trumpet, and they shall gather together His elect from the four winds" -- out of their graves in a resurrection (Matt. 24:31). Lazarus is to be resurrected, and carried by the angels through the air to meet Christ, at His return, and to be with Abraham, in the intimate relationship of father and son! Lazarus will then enjoy the fond embrace of his father through Christ, Abraham --	both then resurrected and living forever more, in the promised land, then inherited! The Bible defines the word "bosom" in Isaiah 40:11. Here we find God will care for His people as a shepherd does his sheep, carrying them "in His bosom." Jesus was "in the bosom" of the Father (John 1:18), enjoying the Father's blessings and close relationship. Moses carried the children of Israel in his bosom (Num. 11:12). To be in one's bosom is to have that one's love and protection, and share his blessings and inheritance. So it will be at the resurrection.“And if ye be Christ's, then are ye Abraham's seed, and heirs according to the promise” (Gal. 3:29). Only God "has immortality" (1 Tim. 6:16). Only true Christians receive “immortality” at the Second Coming (1 Cor. 15:50-55). It was Satan who told Eve she wouldn't die (Genesis 3:4). The doctrine of souls burning forever is rooted in the idea that “the soul can’t die.” But God said she would die (Genesis 2:16-17). ”Then Jesus said: "And in hell he lifted up his eyes" (verse 23). His eyes had been closed, in death, and now there came a time when they opened - he "lifted up his eyes" in a resurrection. What kind of "hell" is this? The rich man was buried in the same kind of "hell" Jesus was buried in! Yes, Jesus died and was buried -- and in "hell"! In the first inspired sermon preached by Peter on the day the New Testament Church started, Peter said: "He [David] seeing this before spake of the resurrection of Christ, that his soul was not left IN HELL, neither his flesh did see corruption" (Acts 2:31). Jesus, too, died and was buried. And in "hell" He, too, lifted up His eyes -- when He was resurrected! The Greek word here is hades meaning "the grave" -- a place of burial in the ground! He lifted up his eyes in a resurrection after the Millenium because Revelation 20:5 says: "But the rest of the dead lived not again until the thousand years were finished." Will this rich man be conscious of the great lapse of time? Of course not. "For the living know that they shall die: but the dead know not any thing . . . for the memory of them is forgotten" (Eccl. 9:5). They are totally unconscious! Job speaks of a dead man and says: "His sons come to honour, and he knoweth it not; and they are brought low, but he perceiveth it not of them" (Job 14:21). Isaiah says our father Abraham knows nothing of us, today (Isa. 63:16). David was inspired to write: "His breath goeth forth, he returneth to his earth; in that very day his thoughts perish" (Psalm 146:4). Then he wakes up and sees a flame which torments him. What is this? It is described in Revelation 20:14-15, as a lake of fire. What happens when one is suddenly so horrified with fear? His mouth goes dry. His tongue sticks to his mouth and throat! The rich man cries out in this mental agony: "Father Abraham, have mercy on me, and send Lazarus, that he may dip the tip of his finger in water, and cool my TONGUE; for I am tormented in this flame." Now if the rich man were in the kind of "hell" most people seem to believe, his whole body would be on fire -- you would think he would have called for at least a bucket of water to put out the fire, wouldn't you? Why did he call for water? -- "to 'COOL MY TONGUE'!" That's what the rich man said! Open your own Bible again, and read it! The flame, he said, was "tormenting" him. This word "tormented," used in verses 24 and 25 is translated from the Greek word odunomai. This is defined in any Greek- English lexicon as "to cause pain, to pain, distress; pain of body, but also, pain of mind; grief, distress," He is resurrected mortal, just as he was before he died --	not immortal like Lazarus. He sees this lake of fire. Now he knows the frightful, the awful doom he is to be thrust into -- to be burned up -- destroyed! He is suffering mental anguish such as he never experienced in his lifetime. His tongue is dry. He breaks out in cold sweat. He cries for a little water on the tip of Lazarus' finger to cool his tongue! He is in a condition of weeping and gnashing of teeth! In Luke 13:27-28 Jesus said: "Depart from me, all ye workers of iniquity. There shall be weeping and gnashing of teeth, when ye shall see Abraham, and Isaac, and Jacob, and all the prophets, in the Kingdom of God, and you yourselves thrust out." Yes, they are going to be in exactly the same position as this rich man! Jesus is using him as an illustration to show these individuals what is to befall them. They are to be thrust out --	into the lake of fire which shall consume them, leaving them neither root nor branch, as the Scriptures say. The gulf mentioned by Abraham which prevents the wicked from escaping death by hell-fire, and which also keeps the righteous from being burned, is immortality. Those who are immortal shall never die because they are born of God (Rev. 20:6). But human beings who have not been begotten and born by the Spirit of God are still flesh, subject to corruption and death. They can be burned by fire. Only the saved possess immortality as the gift of God (Rom. 2:7), but the wicked reap anguish and wrath that shall devour the adversary --	fiery indignation (Heb. 10:27). What happens when a human body is being burned by a flame? “God is love” (1 John 4:8). He is not a tyrant who will burn people forever. Each person will be judged fairly, “according to his works” (Rev. 20:13). “Just and true are Your ways, O King of the saints" (Rev. 15:3). "For God so loved the world, that he gave his only begotten Son, that whosoever believeth in him should not perish, but have everlasting life" (John 3:16), "for you are a gracious and merciful God” (Neh. 9:31). "For the wages of sin [the transgression of God's law -- 1 John 3:4] is DEATH [the cessation of life]" (Rom. 6:23). "Behold, all souls are mine, as the soul of the father, so also the soul of the son is mine: THE SOUL THAT SINNETH, IT SHALL DIE" (Ezek. 18:4). God mercifully puts an end to their life. And even in this act God is NOT pleased. "For I have NO PLEASURE in the death of him that dieth" (Ezek. 18:32). God does not want anyone to be thrown into this lake of fire! But those who insist on living contrary to the laws of life are going to be mercifully snuffed from existence by this method. "For if we sin willfully AFTER that we have received the knowledge of the truth, there remaineth no more sacrifice for sins, but a certain FEARFUL looking for of judgment and fiery indignation, which shall DEVOUR the adversaries" (Heb. 10:26-27).